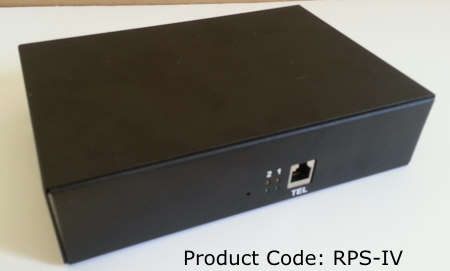 The RPS-IV (RPS 4) allows for remote power control of 2 individual ports over the telephone. The remote power switch unit is fully voice prompted and guides you through options including Power On and Power Off. What are the electrical specification of the RPS-IV Remote Power Switch? There is a 12 amp max. for all ports with a 8 Amp maximum per individual port. 2 switchable electrical ports are on the RPS-IV unit. 110-120V US. Do you have a European Version of the RPS-IV available? No, a 220V version is not presently available. Can each electrical port be controlled individually? Yes, you can control the power on / off status of each of the 2 ports individually. What are the dimensions of the RPS-IV Unit? 7" Length x 5" Wide x 2" Thickness. Does the RPS-IV (RPS 4) work with an answering machine? The RPS-IV uses voice prompts to interface with the user. As the unit talks to you upon pickup, it would interfere with the answering machine voice prompts. Use with an answering machine is not recommended. If you need to use a remote power control device with an answering machine, please see our RPS II (Two) Device by clicking here. Does the remote power control unit RPS-IV require any drivers for operation? The RPS IV is completely independent from your computer/device. The unit houses all its own processors. No drivers of any type are needed for operation. Can I power on / off the individual ports manually while the RPS IV unit is in front of me ? The device is only controllable over the telephone. There are no additional power control options on the outside of the unit. How do I reset my login password? I forgot it ! If you forget your password, press the RESET button on the front of the unit. It will reset the device to factory defaults setting the password to 123456. Note the password must be 6 numeric characters long. What is the warranty period on the RPS-IV (RPS 4)? The remote power switch comes with a one year warranty against manufacturing defects. The warranty is not applicable if the device has been exposed to power surges, the case opened, improper installation or mishandling. Will you ship out of the USA or Canada? Can I change the password to login to the RPS-IV ? YES, the default password for login is 123456. The interface allows you to easily change the password of the unit to whatever you desire. Just follow the voice prompts once you telephone the unit to access the password option. Note that the password MUST be 6 characters long. What is the discount for buying multiple units? Well, there is not any! Devices such as this typically sell for over $300 and are not readily available. WE OFFER A 30 DAY MONEY BACK GUARANTEE and a ONE YEAR WARRANTY for orders shipped in the USA and CANADA! How long have you been selling Remote Power Switch Products ? We have been selling inexpensive high quality remote access devices since 1990. Can I read your Instruction Manual Online? YES Click Here! For full information.